The Snowbee 3 in 1 Trout Net comes complete with two telescopic aluminium handles. The shorter model is only 12″ (30cm) when closed, providing an ideal river ‘scoop’ net, particularly for competition fishing. This telescopes out to 18″ (46cm) for additional reach and fits neatly within international competition rules for overall length. 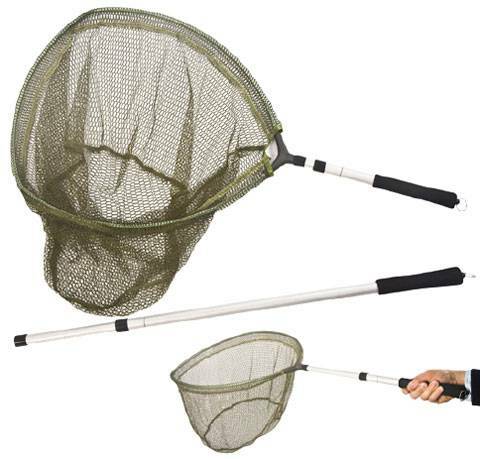 The second telescopic handle extends from a closed length of 25″ (64cm) to a fully extended length of 45″ (115cm), providing an ideal river bank or small Stillwater net. Both handles are fitted with high-density foam grips. This versatile net really is a 3-in-1 for the river or bank angler. The D-section aluminium frame is ultra lightweight, yet offers amazing strength and rigidity. Attached to this is Snowbee’s new hexagonal Rubber-Mesh knotless net, which has a flat bottom panel for the fish to lie in – ideal for catch & release, as this design minimises scale damage. This entry was posted in Accessories, Fly Fishing, Landing Net, Rivers, Salt Water, Stillwater and tagged boat net, hand net, landing net, scoop net, snowbee 3 in 1, trout net by fftcouk. Bookmark the permalink.